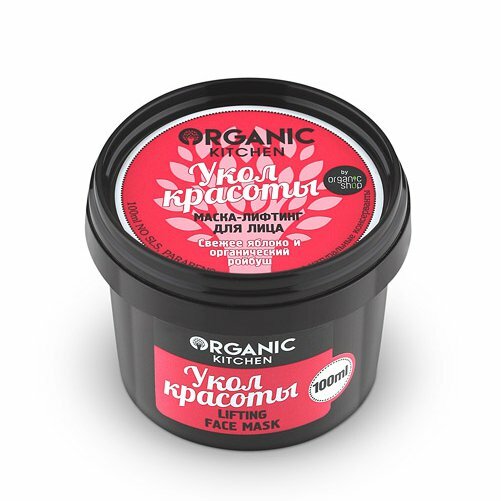 Beauty Injection Lifting Face Mask is produced by the Russian beauty brand Organic Shop for its Organic Kitchen series. The product is formulated with apple extract and organic rooibos extract. It has a pronounced lifting effect in your skin, improves skin elasticity and face contour, eliminates fine lines and prevents premature wrinkles. The mask contains organic rooibos extract that softens and moisturises the skin, improves its elasticity and provides the skin with amino acids. Apple extract contained in the product has a lifting and rejuvenating effect, refreshes the skin and improves complexion. The mask is enriched with bitter orange extract that stimulates skin cell regeneration. It has antiseptic properties and thus prevents inflammation and some common skin problems such as acne. The extract also helps your skin to retain moisture. Directions. Apply onto cleansed skin, except for the area around the eyes. Leave for 8-10 minutes, rinse with warm water. Ingredients. Aqua, Panthenol, Xanthan Gum, Pyrus Malus Fruit Extract, Organic Aspalathus Linearis Leaf Extract, Sodium Hyaluronate, Citrus Aurantium Amara Flower Extract, Sucrose Laurate, Sucrose Dilaurate, Sucrose Trilaurate, Sorbitol, Parfum, Citric Acid, Benzoic Acid, Sorbic Acid. Want to buy Beauty Injection Lifting Face Mask? Call us or submit your order via our web site!